This is an outrage!!! They only chose one of my finals for series 2? I'm hurt. I really hope they make the boxes blue though. Something a bit odd... anyone else notice Fryin' Ryan's name is writen "Frying' Ryan"? SPLIT KIT!!!!!!! 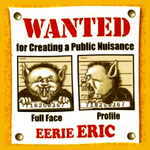 EERIE ERIC!!!! Pinch me!!! PINCH ME!!! EERIE ERIC Funko!!! I like the SPLIT KIT and MEAN GENE too. It's great to see that they're releasing more of the GPK characters. Definitely hyped about this release! i need to get it together and get series 1 set going. How many figures in series 1 and whats the cheapest you all have seen a set go for? characters with guns? right on! Any word on a BIG fig? That's awesome news. Props to Funko! Please GOD, SAY ADA BOMB!!!!!!!!!!!!!!!!!!!!!!!!!!!!!!!!!!! It just makes sense!! That's fantastic news! I JUST finished the first series last night! Of course, I had to wait till they discounted the blind boxes to 5.99 at Target before I could do that, but hey, im happy with it! I really hope they don't mess with the size of the GPK Funko. My OCD will go nuts if they don't make S2 the same size. A month to go before we all get to hold a Split Kit Funko! GPK is heating up this Fall! Funko had a booth at New York Comic Con last week and no prototypes were displayed. Their employees were extremely rude so you couldn't even talk to them or ask any questions. It really left me hating Funko and I've since stopped buying their products. but without any pictures, I'm rather skeptical.